Near the town of Winter Park, an old dirt road heads up into the mountains. 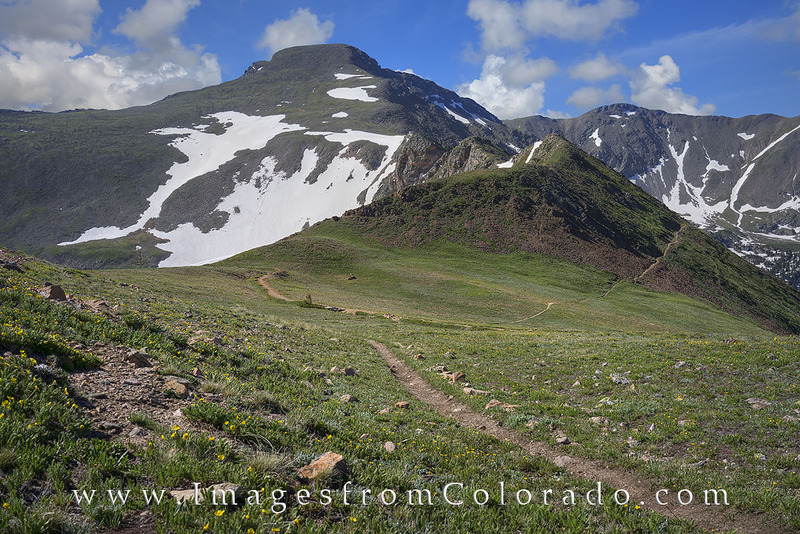 Several miles up, a trail leads off towards the higher Front Range peaks - one of which is James Peak. By Colorado standards, James Peak isn't that imposing, standing only 13,300 feet. However, it does make for a nice walk up and provides a great view of Winter Park and the Fraser valley. As one of Colorado's 13ers, James Peak rises to 13,301' (depending on which source you use, it could appear a bit higher or lower) and is nearest to the town of Winter Park. In this photograph, the trail can be seen crossing Rogers Pass and heading to the distant summit. The route is easy to follow and is around 8 miles round trip. It departs from the Rollins Pass Road, a bumpy 4WD road that exits off Highway 40 near the Winter Park ski base. This peak makes for a great morning hike. Photo © copyright by Rob Greebon.